Daika Rice Dryers™ have been perfected from many years of experience in the field of drying by Advanced Dryers Systems, Inc. (ADS) of Florida, USA. The technology used in Daika Dryers™ allows for the optimization of the drying thermodynamic cycle. Most dryers on the market today are based on the single principle of using heated air. This principle is fairly efficient when ambient air is relatively dry. However, when ambient air has high relative humidity such as found in tropical countries, to maintain drying efficiency the temperature must be increased. This is contrary to the requirement for higher quality products which must be dried at as low a temperature as possible. A dehumidifier section with an evaporator enhanced by a Heat Pipe Battery (an invention of Heat Pipe Technology, Inc., an affiliate of ADS. Patents #5,404,938, #5,845,702). A heating section that uses the heat from the heat pump cycle to heat the drying bin. 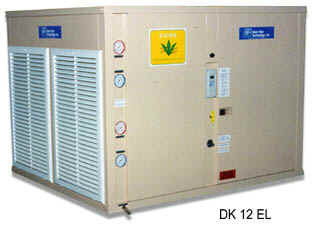 The DK IC Series also use the heat recovered from the engine cooling and exhaust. Due to the dehumidification function, the efficiency of Daika Dryers™ is maximized, even when outdoor relative humidity is 100%. At the same time, the drying air is kept at a relatively low temperature to insure the high quality of the products. This results in substantial economy in energy and allows for shorter drying time. Fast drying of food products such as rice, wheat, corn, soybean, coffee, fruits and vegetables. Low drying temperatures producing high quality products. No electricity required for gas or diesel powered models. Specially designed for tropical climates with high humidity. Lightweight. Easily moved on a trailer platform or by hand.